I didn’t used to be interested in used book sales. As much as I love books, I’ve struggled with facing roomfuls of cheap used books in the past—it’s overwhelming to this HSP underbuyer, and I don’t want to bring clutter into my life! That changed about a year and a half ago, when we moved to a house with space for a library. We planned to build bookshelves (which are now complete) and we didn’t think we had the books to fill them. We happened to move just before a major book sale at a nearby historic home, so we went. It was our first visit to a used book sale in a decade (maybe two), and we quickly saw what we had been missing out on. All the books are donated; all the funds go to a good cause. And they are cheap. When we went to our first used book sale, I didn’t know what I was getting into, so I didn’t have a strategy in mind. There’s another used book sale this weekend, and I will be there. 1. Give yourself freedom to have fun with it. My biggest tip has to do with mindset. Don’t try to maximize. Don’t beat myself up about coming home with a book you already own, or leaving a book at the sale that you thought you owned, but don’t. Take a chance on books that look interesting that you might end up not wanting to keep, because at fifty cents to a dollar each that’s not much of a mistake, long-term. This is a low-stakes way to build your book collection. Have fun with it. 2. Bring a tote bag (or three). 3. Start fresh, then browse. Have you ever been to IKEA? I enter IKEA filled with enthusiasm for all my home adventures. I’m going to organize my bathroom and find cute throw pillows and find a step stool for the pantry and wait, aren’t these planters cute? 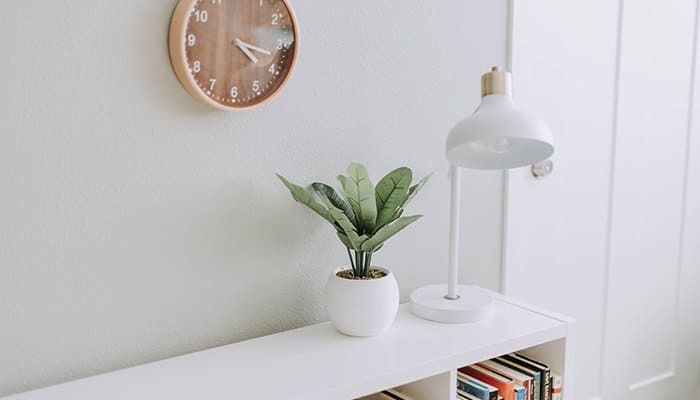 But I cannot sustain this pace for 300,000 square feet (which, if you’ve ever been to IKEA, you will not be surprised to learn is equal to about five football fields). And I leave a depleted, overwhelmed human who just wants to sit down and not make a decision about one more thing. I want this book sale to be FUN for you, and so I ask that you tackle your priorities while you’re fresh and full of bookish enthusiasm. When your priorities are complete, browse at your leisure. A room full of books sounds like heaven … but it can also be completely overwhelming. Hunt for your priority purchases before overwhelm sets in. 4. Stash your books by the register. You brought your tote, but at most sales you can camp your to-purchase stack by the cash register. If you have a few post-its and a pen with you, so much the better. With these personal rules in place used book sale shopping turned out to be lots of fun. Anything I’ve read and loved, but don’t yet own. Anything I want to read that’s available in a particularly attractive edition. Penguin classics, because used book sales turned me into a low-key collector. Whatever your priorities are (and I’d love to know—tell us in comments), do those first. I’m not typically much of an impulse shopper, but here, it’s okay. Low stakes are your friend. 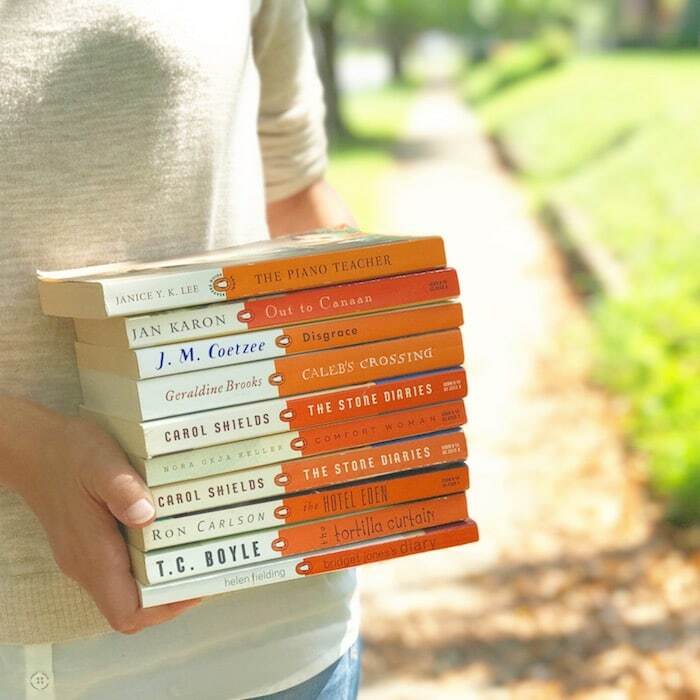 Take a chance, and if that book doesn’t end up being right for you, you can give it to a friend, pop it in a Little Free Library, or donate it back to the used book sale and continue the circle of bookishness. 8. Judge a book by its cover. Or spine. At a used book sale, buying a book because it’s pretty is 100% okay. That’s the real reason behind my Penguin classics collection: those cheerful orange spines make me happy every time I see them. So whether it’s an outdated history series or cookbooks featuring80s culinary classics, if you think that beautiful book would look great on your shelves, go for it. 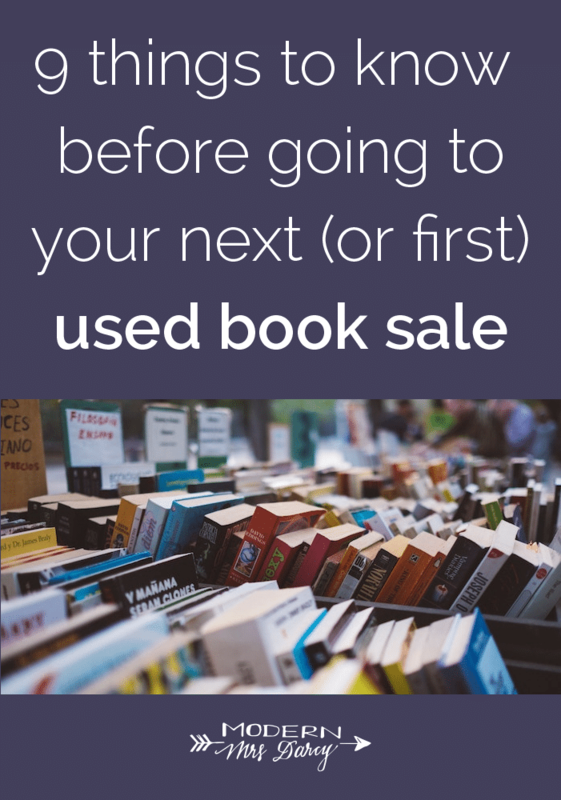 Are you a used book sale shopper? What strategies do you rely on? We’d love to hear your best tips (and favorite finds) in comments! I usually go only to my library’s book sale (no strategy) simply to support them and hopefully find a book or two (I try not to buy much as I’ve typically donated a couple boxes myself to clear the shelves a bit!). But back when my kids were young I bought a lot of cheap but great books for them there. However I do shop at “ The Book Barn” in Niantic, CT and go more for the experience on a nice day with the bonus of always finding a small stack to cart home. It is a book lover’s dream but again I go with no strategy other than a list of some author sections to look through after I meander through all the new arrivals sections to see if anything appeals. It’s a fun place to browse!! The Book Barn is my favorite!! I lived in Norwich, CT, for 4 years and the Book Barn is the place I miss most. We visit the Book Barn about twice a year. I love the place! My very first book sale, I didn’t bring a tote bag — and I learned at the door that they had an all-you-can-fit-for-$15 deal going on if you BYO Tote. I ran home, came back 20 minutes later with my own bag, and played Tetris with alllll the books until I couldn’t possibly fit any more in the tote. 😀 GLORIOUS. Your tips above are great, and I have one more to add: bring cash! Most book sales I know rarely accept credit cards, even if you’re dropping $20-$50, and most people I know rarely have cash on them without advance notice. So, be sure to hit up an ATM before you go to the sale. Set an alarm on your phone. Works best if familiar sale. Have a list of books you’re looking for..
I’m so glad you mentioned this! I went to a book sale once where I had to leave books behind because I didn’t have enough cash (or the stamina to go looking for an ATM at that point). It was a sad lesson to learn but I know better for next time! 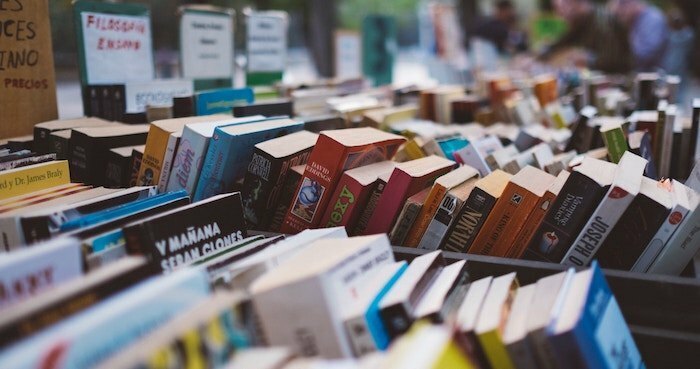 Any tips on finding good used book sales? How are they most commonly advertised? When I lived in CT, I used to love the Pequot Library sale in Southport. It’s huge! Lots of pros also buy there, so go early the first two days! My best resource when my kids were young was the children’s librarians. I’d ask them for recommendations. There were some I was skeptical about, but my kids LOVED them. Children’s librarians are a huge, unused resource! Is there a website for used book sales ? I live in the DC area so it can just be overwhelming to find out what’s going on where and when! https://www.booksalefinder.com/ is the website I use most often. I also subscribe to my library’s newsletter, which includes info about upcoming events, like book sales. I live in DC too, and my local libraries (Southeast and Northeast) have monthly used book sales. There’s also a section in the library you can buy on the honor system (MLK downtown has a huge section for when they eventually re-open). Get on the email list for your local library and then you’ll always know, but I know mine are the same Saturday of the month so it’s predictable. I have a lot of unread books but that has never stopped me from buying more. I take pictures of books I currently own if i am trying to finish out a series or an author’s books. This way I cut down on some duplication. I also have a tote bag on wheels that i take with me to our annual used book sale. I park it out of the way so i am not hitting people with it. I second the thing about it is a cheap way to find new authors. I try to always buy a book that i wouldn’t normally read. Arrive before the doors open, so that you can be one of the first to look at things before they get picked over. I went to one last week and they are just so fun! By me there are also a whole bunch of community garage sales — run as fundraisers by schools or churches, they sell all sorts of stuff, but typically have a pretty robust book selection since so many families contribute. I usually try to go with just a few authors to look for in the adult fiction and then spend most of my time poring over the kids books. I keep an eye out for Newbery books I don’t have yet, favorite authors/illustrators, poetry collections, and illustrated editions of classics, etc. I love when a random book I’ve never heard of catches my eye and I’ve really found some gems that way! Even though the books are cheap and the money goes to a good cause, I try to not pick up books in really poor condition unless I happen to know it’s a really hard to find title — chances are I’ll find a copy in better shape and a future sale — or even just on another table! For the past 11 years I have attended the American Association of University Women Used Book Sale held annually at the Agricultural Arena at Penn State University in University Park, PA. I usually go only the first day (it lasts four days!) in the afternoon to get the best selection, but to avoid the massive crowd in the morning. Even then I have to wait in line to get inside! My usual strategy is to check out the children’s tables first with my two older kids. Then it is on to the fiction tables (and if I am feeling extra ambitious, I peruse the boxes under the tables). Next, I scan the mystery, literature, history, current affairs, and self-help tables until I am exhausted. I avoid some tables because I have no interest in those topics/genres (e.g., science and technology and cookbooks). I make sure that I have plenty of cash because the volunteers do not take checks or credit cards. Depending on the type of book, the cost per book is 50 cents to 5 dollars, and they are all in perfect condition. And I don’t care how much I spend because all of the proceeds support scholarship and other educational programs for women. I have a rough list of authors and/or titles that I would like to get, but I am open to trying unknown books and authors if the book cover and inside description pique my interest in some way. Sure, I have read some real duds as a result, but have also found some books that I have loved. Gretchen, the AAUW Used Book Sale in State College is my FAVORITE! Thanks for making me smile while recalling it! This past year I bit the bullet and got in line early in the morning on the first day of the sale, and it was TOTALLY worth it! I came home so happy, with my bags full of books. What I love about used book sales is that I am willing to take a chance not only on titles, but on authors, and I often come out with several books by an author whom I’ve never read before! But like you said, it doesn’t matter if the titles or authors are winners or not for me personally, because I know I am supporting a wonderful cause. I can’t be one of those early birds because (1) I take my two older kids with me and no self-respecting kid will be up that early to wait in line; and (2) my parents drive all the way from Pittsburgh that morning for the sale. 🙂 It is truly one of my favorite days of the year! 1. Make a running wish list and keep it on your phone. 2. Children’s board books are a great value, but go fast. 3. Cookbooks are plentiful, cheap and fun. 4. Great values on quilting, art and architecture books. However, make sure that the books have all their pages. 5. Hobby pattern books, but check pages. Yes, what Martha said. I have a list app on my phone (I use Ita, which is very basic, there are probably fancier ones but Ita works for me), and one of the lists i keep is “used books” so when I come across a sale or a used bookstore, I can remember what I want- like a better looking copy of Brideshead Revisited or older copies of Josephine Tey or whatever. Also, as Martha said, i’m surprised several people have said they skip the cookbooks- new ones are so expensive and you can find amazing deals. But then, I have a weird love of reading cookbooks, even though i’m only a passable cook. I stumbled into my library’s used book sale in May. I had no idea what I was doing, but I managed to find a few things for myself, and my kids. A couple turned out to be “not for us” but, like you mentioned, I can put them in the little free library or donate back for the next book sale. When it came around again in August-I felt I was so much more equipped. Having a better understanding of my own preferences, plus some titles fresh from What Should I Read next, I found a few from my favorite authors, and even better options for my kids! I go to a monthly book sale that our Friends of the Public Library hosts. Once you know where your favorite sections are, it’s a faster process. I keep an inventory of books I own on my LibraryThing app so I can know what I already own. I also buy extra copies of favorites for the little Free Library. I am a complete sucker for any of the vintage Modern Library books! I simply love the petite size and the feel of the super-thin pages. One of my most cherished possessions is my vintage Modern Library copy of “A Tale of Two Cities” (Charles Dickens). Picked up during my beloved years in NYC amongst the wonderful ongoing sidewalk “used book sales”. When I read it, I feel transported back in time, while it still lives up to its’ brand by fitting beautifully into my side pocket of my bag. They may be vintage . . . but modern always . . . So you have to buy a ticket and THEN buy books. Doesn’t seem like that’s a “good deal” to me. Especially since it’s not my towns’ library foundation. $40 to get in??? Good grief that’s ridiculous. There are two annual charity used book sales in our town and they are both free. Totally agree that’s not worth it. Does anybody go? I love this idea, Lesley! I can see it in my mind from your description. Such great artwork in these vintage books that should continue to have a life in modern times. . .
Have loads of cash. Once I missed a boxset of the Master and Commander series. Oh well. I collect children’s books and especially like Newbery winners and finalists. Having a list on my phone would probably help me but truth is there are very few kids books at sales around here. Thanks for all the suggestions. I went to my first library book sale recently and loved the fill your tote for $8 deal.. I tried a lot of different books because if it didn’t work I’d really only spent about 50 cents on it. For anyone in Massachusetts in Burlington & Middleton the Used Book Superstore is have a huge used book sale. As we get closer to the weekend the prices get better 30/$10 adult books, even better price for kids books and a huge selection. http://www.usedbooksuperstore.com it might be that the big sale is Burlington ony… definitely worth checking out. We have an annual book fair locally which has about 100,000 books for $1-4 each. My advice is Go For It! Buy anything that takes your fancy. I have discovered wonderful new authors and books by buying impulsively. Anything I don’t like gets donated to a charity shop for someone else to try. When I went this year I was talking to an organiser and he said a few years ago people were telling them the days of book fairs were limited, due to Kindle etc. But it has gotten bigger and more popular every year. I love going and being surrounded by hundreds of equally over-excited book lovers! (Until they’re getting in my way while browsing ?). Reading is the best!! I love, love, LOVE my town’s library book sale…and even though I grew up here, I cannot believe I had never been until this spring. It’s held in the old officer’s club on the (now defunct) naval base on the end of the island, and it is glorious. 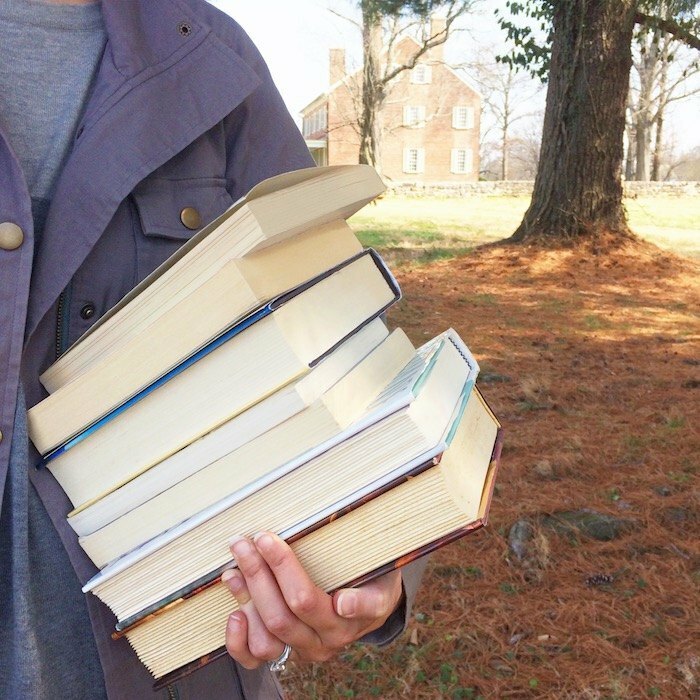 This spring, I only found out it was going on the last day, and still managed to come home with two bags full of books — you better believe the fall book sale is already on my calendar! Big books! I use my library regularly but some books (door stop biographies of Grant come to mind) take longer than two weeks. I always keep my eyes out for these books at my library’s sale. I found a real treasure at one of the book sales at Locust Grove. It was my favorite book while in elementary school, and I would check it out over and over again at the school library. My eyes popped when I saw the book, there it was, White Squaw with the same illustration on the front of Jenny Wiley, same hardback feel. What a wonderful surprise. You never know what you will find at a used book sale. My most prized possession came from the used book sale in AL, our main branch had when they remodeled. I was a college student and went with my dad and brother and bought childrens books for my classroom library. When we got to the car and compared treasures my dad said “This is your favorite, isn’t it?” And handed me an old copy of To Kill a Mockingbird. “Open it” he said. It was signed. He paid .50. MMD where is the Louisville sale please? What an incredible story!!!!! ??? you lucky duck!! As a worker and a shopper at my FOL semi-annual sales, amen to those who said BRING CASH! We always disappoint someone who assumes we’ll take a card (because fees, people!) but we will hold their selections until closing to go to an ATM machine and come back. We take checks, but it takes a lot of time to get the information required and check them against our BAD CHECK list, so you’ll check out faster with cash, especially at the “Cash only” stations. I’m feeling like cookbooks are really getting bashed here, so maybe your readers don’t cook or like me, already have a baker’s rack full of cookbooks. But I have found the booksale invaluable for specific cuisines or topics like canning. You won’t be forced to leave with a copy of “In the kitchen with Rosie”! My Bookcrawler account is my friend at book sales. It’s on my phone and I can quickly determine if I have the title in question. I took the time to list my home library one summer and add new titles as they come into the house, bringing my current list to about 4000 titles ( don’t judge me ?). I love a good library book sale! I look for the mysteries first & then I just wander. Estate sales sometimes feature a sale of books. Tip #2: always bring cash, just in case! I was going to suggest Libib for this very reason! Don’t bring your purse/handbag. Slip some cash (simple way to control spending) and your cell phone in your pocket and leave both hands free to peruse the shelves and lug around totes filled with beautiful book bargains. Have you heard of the VNSA sale? It’s one of the biggest used book sales in the country and happens every year in February in Phoenix. It’s so popular that people will get there at 4 or 5am to line up, because they can only let a certain number of people in at a time. My sister has been going for years, and this was my first year. Her advice? Go to the children’s section first–it sells out the fastest. The classics section always has lots to choose from, and moves slower. I’ve learned to start in the bargain section first. At used book sales all of them are fairly inexpensive but usually there’s a section where they’re 50 cents apiece or “fill a bag” for $3 type of thing and there’s often some gems in there. Once I gathered a whole bag full in the non-bargain section only to find several of these books in the bargain area. If you don’t care about the edition, scope out the bargains first. I agree with going to your priority first while you’re energized and excited and to get the books you really want before someone else does! Anne, I’m so excited! I went to a library used book sale today, and my big score was a brand new, collectors edition of “Still Life” by Louise Penny, starring Inspector Gamache, for $2. The reason this is so exciting is that I’ve never read any of them, never even HEARD of them, but I kept reading about them on your blog!! And your followers recommended them in comments—-so I am SO EXCITED to finally be reading one (and the first one, even better)—and I think that I am really going to love Inspector Gamache. Thank you. I don’t often go to book sales of the kind you described (they just don’t seem to happen often in my area), BUT I am a secondhand bookstore fiend and I can tell you that a lot of the same rules apply in that space. Knowing your priorities is SUPER important. 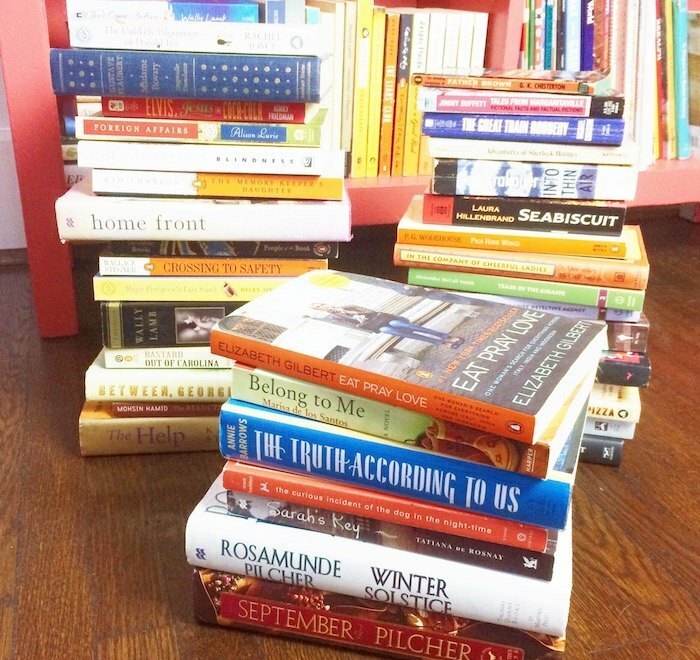 Personally, I committed to buying all of the 109 books on my blog’s reading list within a strict budget, and I’ve got almost all of them from secondhand/thrift stores. I’ve also committed to ONLY buying books on my List until I have them all, so they’re my priority wherever I go! I’ve actually found that it’s a lot more fun (for me) to shop for books that way, with a list of specific titles – otherwise I get a bit overwhelmed and want to take them ALL home. I would add that you should ALWAYS check (first!) any “newly arrived” or “to be shelved” section (if an employee/volunteer is unpacking a box, try to sneak a peek at what they’re pulling out – politely, of course). You’ll ALWAYS find the best bargains there, before they get picked over by everyone else (and they always seem to “stick out” more to you when they’re not in a sea of other similar titles). My husband and I gave out used books for our wedding favors and found them through these kinds of sales! I can’t pretend it was a low time investment favor, but NONE of them were left behind, which made it all worthwhile in the end. 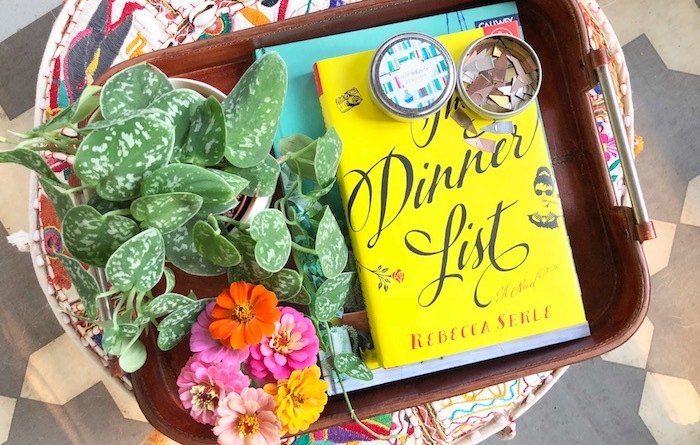 We are both avid readers and had worked at the same bookstore for a time during our courtship so we thought it would be perfect to give each of our guests a book we thought they would enjoy. When we got overwhelmed with planning we’d take ourselves to a library or Out of the Closet and shop for books with our guest list in hand. Most were less than a dollar and everyone loved finding their book on the shelf at our reception. Plus it was a great conversation starter since we didn’t have a seating chart.